Up to 29-50% Discounts available to Cities, Counties, Non-Profits, Small Businesses, Canadian Companies & MORE! But of course COST can get in the way especially where IT budgets are so often limited and/or challenged by more pressing spending priorities! We designed Smart Scheduler for EnterpriseOne customers of every size and in every industry and location. The idea for the discount program originated after InFocus this year when Circular Edge reviewed just how many city, county and non-profit system administrators, ERP managers and analysts (technical and functional) had been attending Smart Scheduler sessions without purchasing the software. In many cases others from the same organization had come back to attend future sessions. On the flip side, Smart Scheduler demos have turned around very quick purchases, even less than 30 days, where companies ranging from $150M to $6B in revenues have reached a tipping point where certain limitations of the standard JDE scheduler are no longer manageable and/or acceptable to the business. In these scenarios, their pain levels (and subsequent benefits) easily exceeded the costs. But in all cases to date these mostly midsize and larger companies have operated in verticals such as manufacturing, distributing, industrial engineering, oil & energy, facilities services, life sciences, automotive, retail and real estate. These special discounts include options to subscribe or purchase so as to accommodate both CapEx and OpEx constrained budgets. We wanted the price to be low enough where cost is no longer a barrier to being able to take advantage of the time saved and operations improved. 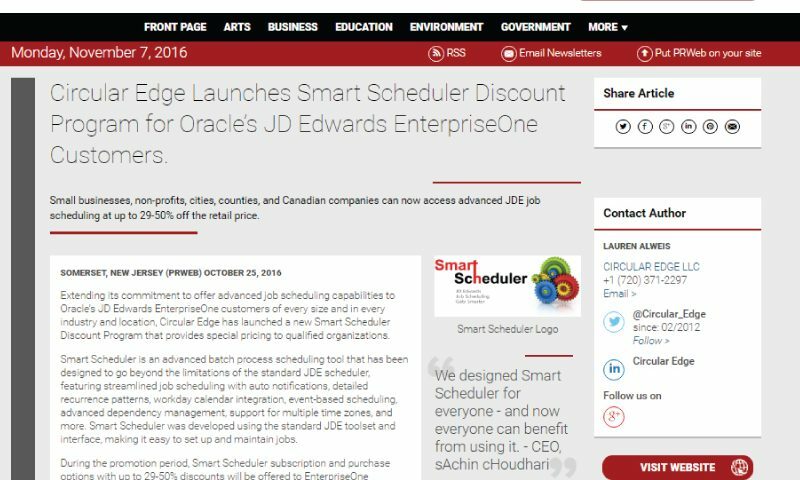 And in the case of JDE customers in Canada who haven't already qualified for one of the other Discount categories – your company will be able to purchase Smart Scheduler in Canadian currency thus eliminating USD currency fluctuations! In turn we hope all of these qualifying customers will be proud to share their job scheduling successes at user groups, conferences or wherever they can to help us continue to grow our business. DISCLAIMER: To ensure reasonable installation volumes, there will be limited availability each month with excess demand being subject to a first-come, first-served waiting list. Circular Edge reserves the right to change the qualification criteria and/or discontinue the discount program in the future. We look forward to working with many new individuals and organizations as part of this special discounting program – it will be exciting to see just how much Smart Scheduler can help each and every one of you who are finally able to get your hands on this advanced batch process scheduling tool!